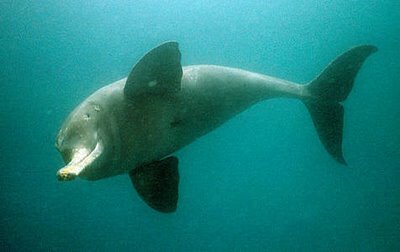 The Indus River Dolphin is now a critically endangered species, only found in the Indus River with a population approximation of only 1,300 thus facing serious threats. A reduction in the water level is conceivably the most obvious of all threats faced by this species. Building of dams and barrages, intensive agricultural practices, insufficient water management, municipal sewage, illegal and harmful fishing practices and mortalities in the fishing gear all had adverse affects on the habitat of the Indus River Dolphin. This project has been developed by the WWF Pakistan to protect the viable population of Indus River Dolphin by conserving the natural biodiversity of the lower Indus river basin Eco-system, and dropping down the the losses of Indus river dolphins by canal stranding through rescue efforts. Supported by WWF – Sweden, WWF – Switzerland,Engro Foods Limited and UNDP GEF/SGP and complements Ministry of Environment Pakistan Wetlands Programme, other major project activities entail improvement of agricultural practices through the development of Better Management Practices (BMPs) and consciousness through a preservation centre and ecotourism. The project also incorporates a strong constituent of supporting livelihoods of stakeholder communities.